Russia views the Estonian, Latvian, and Lithuanian SSR's as legal constituent republics of the USSR and predecessors of the modern Baltic states. The Soviet Union (short for the Union of Soviet Socialist Republics or USSR)  was a single-party Marxist–Leninist state. It existed from 1922 until 1991. It was the first country to declare itself socialist and build towards a communist society. It was a union of 14 Soviet Socialist Republics and one Soviet Federative Socialist Republic (Russia). The Soviet Union was created about five years after the Russian Revolution. It was announced after Vladimir Lenin overthrew Alexander Kerensky as Russian leader. The communist government developed industry and over time became a major, powerful union. The largest country in the Union was Russia, and Kazakhstan was the second. The capital city of the Soviet Union was Moscow. The Soviet Union expanded its political control greatly after World War II. It took over the whole of Eastern Europe. Those countries were not made part of the Soviet Union, but they were controlled by the Soviet Union indirectly. These countries, like Poland, Czechoslovakia, and East Germany, were called satellite states. Although the constitution said the Republics could leave the Union if they wanted, in practice it was a completely centralized government, with no states' rights for the member countries. Many believe[who?] 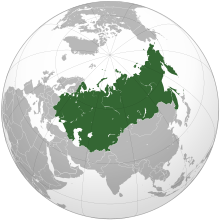 that the Soviet Union was the final stage of the Russian Empire; since the USSR covered most of the land of the former Empire. The Union was formed with the professed idea to give everyone equal social and economic rights. There was virtually no private property - everything belonged to the state. 'Soviets', or workers' councils were created to speak for the workers, and served as an elite group to govern them. It was successful in many fields; putting the first man and satellite into space and winning World War II alongside the United States and United Kingdom. However, its centralized government found innovation and change difficult to handle. The union collapsed in 1991, partly due to the efforts at reform by its leader, Mikhail Gorbachev. From 2013, the document that confirmed the dissolution of the Soviet Union is missing. The Soviet Union was made of 15 republics. These were either Soviet Socialist Republics, or Soviet Socialist Federal Republics. Each republic was independent and handled its own cultural affairs. Each also had the right to leave the union, which they did in 1991. 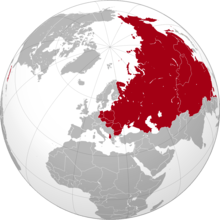 The Soviet Union at its largest size in 1991, with 22,400,000 square kilometres (8,600,000 sq mi), was the world's biggest country. Covering a sixth of the world's lived in land, its size was comparable to North America's. The western part (in Europe) accounted for a quarter of the country's area, and was the country's cultural and economic center. The eastern part (in Asia) extended to the Pacific Ocean to the east and Afghanistan to the south, and was much less lived in than the western part. It was over 10,000 kilometres (6,200 mi) across (11 time zones) and almost 7,200 kilometres (4,500 mi) north to south. Its five climatic (different weather, temperature, humidity and atmospheric pressure) zones were tundra, taiga, steppes, desert, and mountains. The Soviet Union had the world's longest border, measuring over 60,000 kilometres (37,000 mi) in 1991. Two thirds of the Soviet border was coastline of the Arctic Ocean. Across the Bering Strait was the United States. The Soviet Union bordered Afghanistan, China, Czechoslovakia, Finland, Hungary, Iran, Mongolia, North Korea, Norway, Poland, Romania, and Turkey at the end of WWII. The Soviet Union's longest river was the Irtysh. The Soviet Union's highest mountain was Communism Peak (today it is called the Ismail Samani Peak) in Tajikistan measured at 7,495 metres (24,590 ft). The world's largest lake, the Caspian Sea, was mostly in the Soviet Union. The world's deepest lake, Lake Baikal, was in the Soviet Union. The last Russian Tsar (emperor), Nicholas II, ruled Russia until March 1917, when the Russian Empire was taken over and a short-lived "provisional government" replaced it, led by Alexander Kerensky and soon to be overthrown in November by Bolsheviks. From 1917 to 1922, the country that came before the Soviet Union was the Russian Soviet Federative Socialist Republic (RSFSR), which was its own country, as were other Soviet republics at the time. The Soviet Union was officially created in December 1922 as the union of the Russian (also known as Bolshevist Russia), Ukrainian, Belarusian, and Transcaucasian Soviet republics ruled by the communist Bolshevik parties. Extreme government-changing activity in the Russian Empire began with the Decembrist Revolt of 1825, and although serfdom was removed in 1861, its removal was achieved on terms unfavorable to the peasants (poor agricultural workers) and served to encourage changers (revolutionaries). A parliament (legislative assembly)—the State Duma—was created in 1906 after the Russian Revolution of 1905, but the Tsar protested people trying to move from absolute to constitutional monarchy. Rebellion continued and was aggravated during World War I by failure and food shortages in popular cities. A rebellion in Saint Petersburg, in response to the wartime decay of Russia's economy and morale, caused the "February Revolution" and the removal of the government in March 1917. The tsarist autocracy was replaced by the Russian "Provisional government", whose leaders intended to have elections to Russian Constituent Assembly and to continue war on the side of the Entente in World War I. At the same time, workers' councils, known as Soviets, sprang up across the country. The Bolsheviks, led by Vladimir Lenin, pushed for socialist revolution in the Soviets and on the streets. In November 1917, during the "October Revolution", they took power from the Provisional Government. In December, the Bolsheviks signed an armistice (peace) with the Central Powers. In March, after more fighting, the Soviets quit the war for good and signed the Treaty of Brest-Litovsk. In the long and bloody Russian Civil War the new Soviet power won. The civil war between the Reds and the Whites started in 1917 and ended in 1923. It included the Siberian Intervention and other foreign interference, the killing of Nicholas II and his family and the famine in 1921, which killed about 5 million. In March 1921, during a related conflict with Poland, the Peace of Riga was signed and split disputed territories in Belarus and Ukraine between the Republic of Poland and Soviet Russia. The Soviet Union had to resolve similar conflicts with the newly established Republic of Finland, the Republic of Estonia, the Republic of Latvia, and the Republic of Lithuania which had all escaped the empire during the civil war. On 28 December 1922, people from the Russian SFSR, the Transcaucasian SFSR, the Ukrainian SSR and the Byelorussian SSR approved the Treaty of Creation of the USSR and the Declaration of the Creation of the USSR, creating the Union of Soviet Socialist Republics. These two documents were made true by the 1st Congress of Soviets of the USSR and signed by heads of delegations. On 1 February 1924, the USSR was accepted as a country by the British Empire. Also in 1924, a Soviet Constitution (set of laws) was approved, making true the December 1922 union of the Russian SFSR, the Ukrainian SSR, the Belarusian SSR, and the Transcaucasian SFSR to form the "Union of Soviet Socialist Republics" (USSR). The big changes of the economy, industry and politics of the country began in the early days of Soviet power in 1917. A large part of this was performed according to Bolshevik Initial Decrees, documents of the Soviet government, signed by Vladimir Lenin. One of the most important and notable breakthroughs was the GOELRO plan, that planned a major change of the Soviet economy based on total electrification of the country. The Plan was developed in 1920 and covered a 10- to 15-year period. It included the making of a network of 30 regional power stations, including ten large hydroelectric power plants, and numerous electric-powered large industrial organizations. The Plan became the prototype for subsequent Five-Year Plans and was basically fulfilled by 1931. Cathedral of Christ the Saviour in Moscow being demolished in 1931. Organized religion was suppressed in the Soviet Union. From its beginning years, government in the Soviet Union was ruled as a one-party state by the Communist Party (Bolsheviks). After the economic policy of War Communism during the Civil War, the Soviet government permitted some private enterprise to coexist with nationalized industry in the 1920s and total food requisition in the countryside was replaced by a food tax (see New Economic Policy). Soviet leaders argued that one-party rule was necessary because it ensured that 'capitalist exploitation' would not return to the Soviet Union and that the principles of Democratic Centralism would represent the people's will. Debate over the future of the economy provided the background for Soviet leaders to take more power in the years after Lenin's death in 1924. Initially, Lenin was to be replaced by a "troika" composed of Grigory Zinoviev of Ukraine, Lev Kamenev of Moscow, and Joseph Stalin of Georgia. Stalin led the country through World War II and into the Cold War. Gulag camps greatly expanded to take millions of prisoners. After he died, Georgy Malenkov, one of the few top officials he didn't kill, continued his policies. Nikita Khrushchev reversed some of Stalin's policies but Leonid Brezhnev and Alexei Kosygin kept things as they were. After the 1936 revised constitution, the Soviet Union stopped acting as a union of republics and more as a single super-country. Stalin died on 5 March 1953. Nikita Khrushchev eventually won the following power struggle by the mid-1950s. In 1956 he denounced Stalin's repression and eased controls over party and society. This was known as de-Stalinization. Moscow considered Eastern Europe to be a very vital buffer zone for the forward defense of its western borders. For this reason, the USSR sought to strengthen its control of the region. It did this by transforming the Eastern European countries into satellite states, dependent upon and obedient to its leadership. Soviet military force was used to suppress anti-Stalinist uprisings in Hungary and Poland in 1956. In the late 1950s, a confrontation with China regarding the USSR's policies led to the Sino–Soviet split. This resulted in a break throughout the global Marxist–Leninist movement. The governments in Albania, Cambodia and Somalia chose to ally with China instead of the USSR. During this period of the late 1950s and early 1960s, the Soviet Union continued to make progress in the Space Race. It rivalled the United States. The USSR launched the first artificial satellite, Sputnik 1 in 1957; a living dog named Laika in 1957; the first human being, Yuri Gagarin in 1961; the first woman in space, Valentina Tereshkova in 1963; Alexei Leonov, the first person to walk in space in 1965; the first soft landing on the Moon by spacecraft Luna 9 in 1966; and the first Moon rovers, Lunokhod 1 and Lunokhod 2. Leonid Brezhnev led the Soviet Union from 1964 until his death in 1982. He came to power after he convinced the government to overthrow the then-leader Nikita Krushchev. Brezhnev's rule is often linked with the decline in Soviet economy and starting the chain of events that would lead to the union's eventual collapse. He had many self-awarded medals. 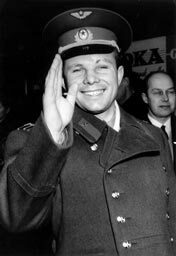 He was awarded Hero of the Soviet Union (the highest honor) on three separate occasions. Brezhnev was succeeded by Yuri Andropov, who died a few years later. Andropov was succeeded by the frail and aging Konstantin Chernenko. Chernenko died a mere year after taking office. In 1980 the Soviet Union hosted the Summer Olympics with Brezhnev opening and closing the games. The games were heavily boycotted by the western nations, particularly the United States. During the closing ceremony, the flag of the City of Los Angeles was raised instead of the flag of the United States (to symbolise the next host city/nation) and the anthem of the Olympics was played instead of the anthem of the United States in response to the boycott. Khrushchev and Gorbachev are the only Soviet leaders to have not died whilst in office. Lenin, Stalin and Khrushchev are the only leaders who were not (de jure) head of state during their leaderships. Soviet leader Mikhail Gorbachev in 1985. Mikhail Gorbachev was the Soviet Union's last leader. He was the only Soviet leader to have been born after the October revolution and was thus a product of the Soviet Union having grown up in it. He and US president Ronald Reagan signed a treaty to get rid of some nuclear weapons. Gorbachev started social and economic reforms that gave people freedom of speech; which allowed them to criticise the government and its policies. The ruling communist party lost its grip on the media and the people. Newspapers began printing the many failures that the Soviet Union had covered up and denied in its past. The Soviet Union's economy was lagging and the government was spending a lot of money on competing with the west. By the 1980s the Soviet economy was suffering but it was stable. Gorbachev's new ideas had got out of hand and the communist party lost control. Boris Yeltsin was elected (democratically) the President of the Russian SFSR even though Gorbachev did not want him to come into power. Lithuania announced its independence from the Union and the Soviet government demanded it surrender its independence or it would send the Red Army to keep order. Gorbachev invented the idea to keep the Soviet Union together with each republic being more independent but under the same leader. He wanted to call it the 'Union of Soviet Sovereign Republics' to keep the Russian initials as CCCP (USSR in English). A group of communist leaders (unhappy with Gorbachev's idea) tried to take over Moscow and stop the Soviet Union from collapsing. It only made people want independence more. Although he survived the attempted takeover, he lost all of his power outside of Moscow. Russia declared independence in December 1991. Later in the month, leaders of Russia, Byelorussia and Ukraine signed a treaty called the Belavezha Agreement to dissolve the USSR; extremely angering Gorbachev. He had no choice but to accept the treaty and resigned on Christmas Day 1991. The Soviet Unions parliament (Supreme Soviet) made the Belavezha Agreement law marking formally the dissolution of the Soviet Union. The next day the Soviet flag was lowered from the Kremlin for the last time. ↑ "Document proclaiming death of Soviet Union missing". 2013-02-07. ISSN 0307-1235. Retrieved 2019-03-10. This page was last changed on 9 April 2019, at 22:55.